Forget about the store-bought varieties of pickles that are commonly found in supermarkets or grocery stores. Pickles are actually easy to make in the comfort of your own home. You just need to know what kind of ingredients you need, and it doesn’t require rocket science to prep them. Once you get the hang of it, you will realise how easy it is to pickle your own fruit or vegetables. The good news is, if you store them properly in a glass or mason jar, they can last up to two months in the refrigerator. But even if you are not confident that homemade pickles can last that long, you will know that they are no longer edible when they turn brown or black. Other warning signs to look out for are mould, mushiness and foul odour. If any of this happens, it’s time to discard them and make a new batch instead. Pickles can be eaten on its own as a snack. You can also consume them as an appetiser, or add them into a burger or hotdog for that added crunch. And did you know that consuming pickles actually give you some health benefits? It can help to boost hydration as well as improving your gut and immune system since fermented food contain healthy bacteria. Well, ready for pickling? Let’s get started as we list down the ingredients and methods on how to make delicious homemade pickles. Here’s the thing about pickling: You can basically pickle almost any vegetable or fruit. That’s the beauty of a pickle and “versatile” is probably the best word to describe it. But in case you are still clueless or opt to play it safe instead, well, you can’t go wrong with pickling cucumbers. This widely-consumed cylindrical green fruit is one of the most classic food staples when comes to pickling. Other fruits and vegetables that are suitable for pickles include carrots, cabbages, gingers, onions, mangoes, watermelon rinds, lemons, papayas, apples and guavas. 2 kg cucumbers (This is just a classic example. You can substitute this with other fruit or vegetable to be used as the base of a pickle). 1) First, you need to rinse the cucumbers under running tap water. Cut the cucumbers lengthwise and ensure they fit well enough into a glass jar or a mason jar. 2) Next, combine the rest of the ingredients in a saucepan over high heat. Remember to stir them occasionally to dissolve the salt and sugar. When the saucepan reaches to a boil, remove from heat and pour the brine slowly into the jar. Do not overflow the jar since you need to save some space — preferably around half an inch or 1 cm — from the top. 3) Place the lid and twist it to close the jar. Allow it to sit until it reaches room temperature before storing the pickle jar in the refrigerator. 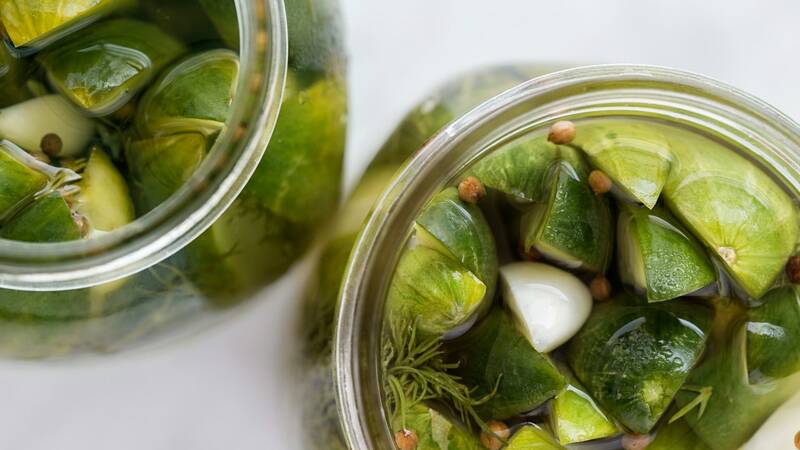 4) For best result, allow the pickled cucumbers to go under the fermentation process so they can absorb all the flavour in the jar at least 24 to 48 hours before serving.